IRELAND promises to be the place to watch golf’s top players in action this summer with leading names from the men’s and ladies tours joining forces with the game’s up-and-coming stars to offer a feast of five-star action. All eyes with be on 2012 US Open winner Rory McIlroy and Open champion Darren Clarke when Royal Portrush hosts the much-anticipated Irish Open at the end of this month. But the European Tour event is just one of a host of top tournaments taking place over the coming weeks, with Ireland holding no fewer than three EuroPro Tour events in the next two months before the Ladies Irish Open is staged at Killeen Castle from August 3-5. David Boyce, Tourism Ireland’s head of business and sports tourism, said: “Ireland has an amazing depth of professional talent at the moment and it’s fantastic that golf fans will have the chance to see them on home soil at close range over the coming months. The Ulster Bank PGA EuroPro Open has established itself as one of the most popular events on the EuroPro Tour and marked the start of an exciting summer of golfing action, with Galgorm Castle Golf Club staging the tournament for the third successive year at the end of last month. The likes of world number two McIlroy, Clarke and fellow Irish Major winners Padraig Harrington and Graeme McDowell will then take centre stage as Northern Ireland stages top professional golfing action for the first time since 1953. Reigning US PGA champion Bradley Keegan and big-hitting American John Daly will also be appearing at Royal Portrush from June 28 to July 1, with the event expected to attract 27,000 people each day. There will be a double header of EuroPro Tour action next month with Fota Island Resort in Cork hosting some of Europe’s most promising players from July 4-6 before the focus switches to Co.Monaghan a week later for the Kingspan Concra Wood Open. And golf fans will be relishing the prospect of seeing the continent’s top ladies stars competing in the Ladies Irish Open for the third successive year at County’s Meath’s Killeen Castle – venue for Europe’s nail-biting victory in the 2011 Solheim Cup. Boyce added: “Everyone wants to see the top players in action but it’s important people realise there are other first-class tournaments taking place throughout the summer. With some of the most famous venues anywhere in the world, Ireland offers golfers the complete package with top championship courses, stunning scenery, fascinating history and some of the best craic around. For more information about visiting Ireland, go to www.discoverireland.com/golf. US Open champion Rory McIlroy will head a star-studded cast taking part in this summer’s Irish Open but it’s not just the professionals who will be flocking to Ireland, with a series of top amateur events taking place across the country. From individual, pairs and team competitions to father and son/daughter, couples, mixed and senior events, there is something for everyone to participate in … whatever your age is. And the series of first-class competitions is reflected in the quality of golfing venues being used with the likes of Royal Portrush, Waterville, Killarney, Ballybunion, Doonbeg, Lahinch, Enniscrone and Portstewart all being used. Sofia Hansson, business and sports tourism executive at Tourism Ireland, said: “Golf is one of Ireland’s most popular sports and you’re never far from a great course, wherever you are in the country. The busy summer of events began this month with the Dunmore East Coast Golf Classic, which is celebrating its 20th anniversary this year. Staged over four days, the team event was created to promote golf on Ireland’s south-east coast and competitors from as far afield as America and Canada have taken part in the past. And interest is also expected to be high in June’s Donegal Links Classic, Causeway Coast Tournament, the three-day Mid Summer Seniors Golf Challenge and 2012 Amateur Team World Cup of Golf, which includes golf at Killarney, Dooks and Waterville. As if that wasn’t enough, the World Invitational Father & Daughter/Son Championships and Atlantic Coast Golf Challenge will be staged in July and August while September will see the Celtic Couples Challenge and Irish Open Venue Mixed Golf Tournament – which includes a round at Royal Portrush, venue for this summer’s Irish Open. Hansson added: “The fantastic thing about the tournaments is that there really is something for everybody, no matter what your age and gender. IT’S been described as one of the real success stories of English golf In virtually no time. Atlantic Links, which encompasses five premier links courses in the South West of England, has become one of the best golf destinations in the UK and is a triumph of co-operation between the clubs, hotels and local businesses. Atlantic Links is a tantalising trail including Burnham and Berrow, Royal North Devon, Saunton, St Enodoc and Trevose but it’s not simply about golf because the South West offers charming coastal delights such as Burnham-on-Sea, bustling market towns such as Wadebridge and Barnstaple, quaint fishing villages like Rock and Padstow and historic cities such as Bristol, Glastonbury, Wells and Bath. The gastronomic delights of the region are not to be missed either, from the exceptional Padstow seafood restaurants of Rick Stein, Jamie Oliver’s Fifteen restaurant on Watergate Bay and Damien Hirst’s 11 The Quay in Ilfracombe, to real English ale and authentic pub grub in abundance. Personally, I found the fish cakes in Squires in Braunton the best I’ve had and the food in the Imperial Hotel in Barnstaple of five-star standard. In recent years the overall standard of accommodation in the South-West has also risen dramatically and there are now a host of character hotels like the Woodlands Country House Hotel, traditional and first-class hotels such as the Imperial, which prides itself on service, friendliness and fine food, to modern seaside hotels such as the Saunton Sands with its spectacular beach view plus comfortable top-value country club apartments, flats and villas at Trevose Golf and Country Club. In turn the hotel and guest house trade have discovered the value of links with their local golf courses and the Saunton club and the nearby Saunton Sands Hotel have forged a strong link, offering stay and play golf packages while at Trevose, owner Nick Gammon has recently opened seven new lodges – an eco-friendly development – each sleeping six people to add to 10 flats, five bungalows and seven chalets plus a cottage, club flat and seven dormy flats. With a quality restaurant and a heated swimming pool, it’s easy to see why Trevose is popular with families as well as golfers, who can choose from three lay-outs in the lee of the majestic Trevose Head. All this, of course, boosts the holiday consumer spend which benefits the South West economy as it makes the golfer and his family think twice about jetting over to Europe – there is something very appealing about loading all the gear into the car and driving down through some of the UK’s best scenary rather than worrying about how much it’s costing to ferry those clubs and cases by plane to Marbella. And the golf is simply superb. Trevose’s 6,973 yard Championship Course was originally laid out by Harry Colt and is a true test of skill with traditionally quick greens all year round – it hosted the 2008 English Amateur Strokeplay Championship – while the nine hole Headland Course is an ideal alternative if the main course is busy as is the Short Course, which runs around streams, over hills and detours past the ruins of the fifth century Roman Church and the second century St. Constantine’s Well. Across the Camel River from Trevose is one of my personal favourites – St Enodoc. 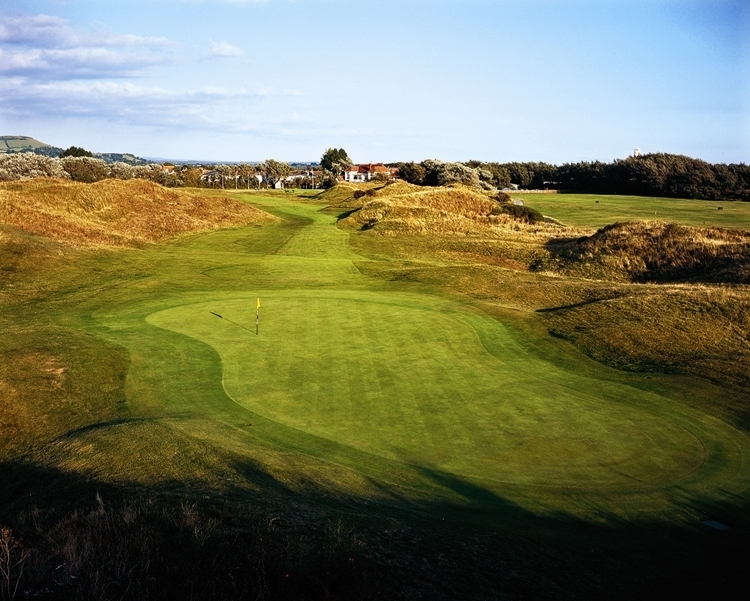 Designed by James Braid, it has a fantastic setting among the dunes overlooking the estuary and with views over the Atlantic. 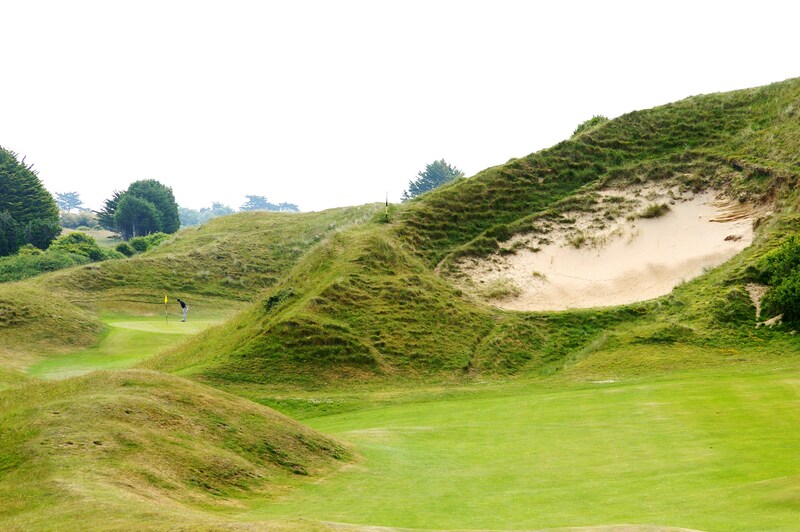 The Church course, so called because of the Norman Church that was uncovered in the middle of the course, is renowned for its towering Himalaya bunker that entirely blocks the view of the sixth green from all but a slither of fairway. The course has benefited hugely from refurbishments that include new greens and tees and this 6,547 yard lay-out is a beauty while the shorter Holywell course, which includes nine par threes, is a little gem. Dating back to 1864, Royal North Devon or Westward Ho! as it is popularly known, is England’s oldest links and it has hardly changed down the years as it set on common land on which livestock still graze. The course looks flat – and it is – but don’t be fooled because at 6,650 yards from the regular tees and over 7,000 yards from the championship tees, it will jump up and bite you if you don’t concentrate. Quite simply, there is not a weak hole on the course while the West course is also an exceptional challenge and it was here in 1997 that a 17-year-old Sergio Garcia won the British Boys Championship, just two years before making his Ryder Cup debut. Not unlike Saunton, Burnham and Berrow is noted for its distinct sand hills and winds that whip in from the Atlantic. The course has evolved over the decades but today’s layout is largely the work of Harry Colt although new tees have produced a course of 6,925 yards with a par of 71 off the championship tees. With average green fees of around £60, the courses also compare favourably with similar quality links in Scotland and Ireland and are a lot cheaper than some of the green fees being asked in Marbella and the Algarve. In terms of travel, the M5 motorway and A39 “Atlantic Highway” and international airports at Bristol, Exeter and Newquay, ensure accessibility. ST Moritz is acknowledged as one of the world’s most stylish ski resorts, but it’s now looking to make its mark as the most glamorous golf destination in Europe. And the Kulm Hotel is at the heart of that with summer golf packages and clinics at its very own golf course as well as the nearby courses of Samedan – the oldest 18-hole golf course in Switzerland – Zuoz and Alvaneu. It may come as a surprise to many that the Kulm Hotel, which commands stunning views of the town and Lake St Moritz, has a golf course, as it is more known for its link with the famous Cresta Run and winter sports, but it does and it is a fantastic little nine-hole lay-out within walking distance of this wonderful five-star hotel. What also comes as a surprise is the quality of the golf courses in the Engadine – and all of them within easy reach of the Kulm and its sister hotel, the five-star Grand Hotel Kronenhof in Pontresina. Zuoz proved to be a tricky marvellous test of golf with stunning views and Samedan proved the same, if on flatter terrain and with plenty of length and water to make it a tough but enjoyable prospect while Alvaneu also boasts breathtaking views and two distinctly different nines. 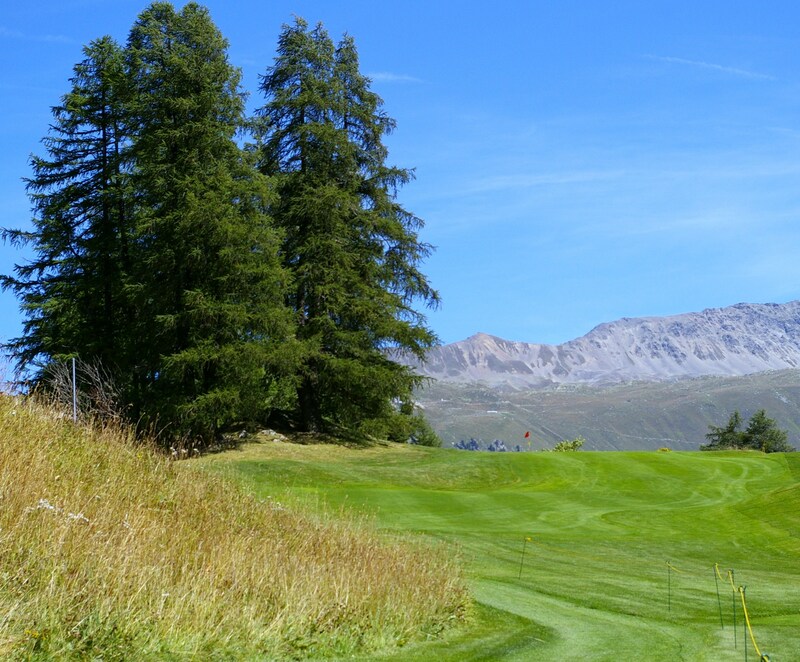 From June to October, you can enjoy play all four courses, which are amongst the highest in Europe, surrounded by magnificent Alpine panoramas and blue summer skies – St Moritz enjoys sunshine 322 days of the year. The Kulm Hotel offers a five-night Golf Safari comprising green fees at each of the four courses, a lavish, hearty breakfast every morning and dinner at any one of the hotel’s three restaurants. There is a shorter option of two or three night Golf Breaks, which includes the chance to play on the Kulm, Samedan and Zuoz courses, breakfast and half board, plus an Alpine wild herb bath in the hotel’s Panorama Spa and Health Club. The nine-hole Kulm course was first laid out in 1891, making it the oldest course in Switzerland, meanders past the St Moritz bobsleigh run and the former Olympic Stadium with spectacular views over Lake St Moritz. Just five minutes walk from the hotel the par 27 course made up entirely of par threes and was renovated in 2001 to bring it up to the necessary standard date for the needs of today’s golfers. With 16 teeing points, no hole is more than 130 metres in length but there are some real testers, especially the uphill first, the tricky fifth and the 82-metre eighth. There is also a practice putting green and a driving range as well as a lovely restaurant Chesa al Parc. The Samedan course demands careful shotmaking. The terrain may be flat but there is plenty of water which comes into play on all but two holes. The 12th is a cracker with the second played over water but you have to be aware of the lakes and streams from the very first hole and there are a couple of terrific par threes at the seventh, 15th and 17th. Then there’s the academy, staffed with five PGA pros and generous short game area with water and sand hazards and 45 bays, some of them covered. Zuoz is certainly not flat and a buggy is a good idea and unlike Samedan there is no much water but there are plenty of trees and doglegs and where there is water it’s used perfectly. The fifth has two lakes which will make you think about the drive and the second shot while the second shares a double green – and a crafty lake – with the 12th but it’s 13 and 14 that will catch the eye. The 13th is a par five and it’s not long but the green is has water on three sides as does the short 14th and that’s repeated at the 15th. It may smack of overkill, but it’s done so well it doesn’t occur and there is a great finish with long par three, a magnificent par five which is well worth its stroke one rating and 18 is a lovely driving hole. There’s also a huge practice area and the course is ideally located just off the main road. Alvaneu was extended to 18 holes in 2002 and with brooks, ponds, and strong bunkering, it’s a ine test. After the turn, the course follows the Albula river valley and the 12th hole is outstanding with its hilltop tee and beware the pond at the tricky 15th hole. After the round there’s a new clubhouse to sample while the facilities at Zuoz and Samedan are equally impressive. The Kulm was first hotel to be built in St Moritz and opened its doors in 1856 and immediately became popular for summer spa and painting holidays, particularly among the Brits. Within two years the hotel had guests staying for the entire winter season after starting the trend for winter sports holidays. The hotel has changed considerably through expansion and renovation, but the fabulous location with views over the lake remains the same as does the reputation for quality and service. With 173 rooms, five restaurants a spa and health club with 20 metre indoor pool, saunas and steam room, jacuzzi, gym and treatment rooms, all with stunning views and six conference rooms, the Kulm is well worth its five-star rating. The Kulm’s watchword is quality and service with wonderful food which is also the case at the Grand Hotel Kronenhof in Pontresina less than five miles from St Moritz especially in the Restaurant Kronenstubli, a gourmet experience not to be missed and neither are the views of the glacier. Getting to St Moritz is not as difficult as you might think with the best route a flight to Zurich and magical train journey through stunning countryside. The Kulm Hotel is inextricably linked to the Cresta Run through the Sunny Bar, where tobogganing pilots have congregated for decades and the walls are lined with trophies and images of famous people who have hurled themselves down the infamous ice track, but now the chances are the area will be remembered as much for its golf courses as for winter sports. WE waited with due deference for the ebony nectar to settle in the dozen pint pots lined up on the bar top. The talk in the snug was already in full flow before the first gulp of Guinness slid effortlessly down our parched throats at the end on a long, hot day on the golf course. There’s no taste quite like it for quenching the thirst and relaxing tired bodies and minds so, to avoid any further delays, another round was ordered with our glasses still half full. Newly-crowned Open champion Darren Clarke would have approved. But we had neither the desire, nor the physical capacity, to match the number of pints he allegedly quaffed to mark each year on his 40th birthday. He had yet to achieve his famous victory at Royal St George’s as we were invited to join the locals in the Munster Bar overlooking the River Suir estuary in Waterford City. The imminent Tall Ships race was mentioned in passing. All the conversation centred on Holywood star Rory McIlroy, who had just atoned for his extraordinary capitulation in the Masters by winning the US Open at The Congressional a year after his countryman Graeme McDowell had prevailed in the same tournament at Pebble Beach. The fact that all three champions were from over the border was deemed irrelevant. “We’re all Irish when it comes to golf,” stressed the chap in the corner seat in answer to our polite query. While the country has its political and religious divides, the Royal and Ancient game does not. This is one golfing nation and pride in its recent successes is palpable wherever you’re in the North or the South. Irish eyes were still smiling when Belfast-born Michael Hoey put the icing on the cake by winning the late season Alfred Dunhill Links Championship at St Andrews. They would have glanced the other way had they witnessed some of the hapless attempts of some of our group to further cement Ireland’s status as a golfing super power. After Irish Ferries had disgorged us from the mighty Ulysses at Dublin, we headed for Waterford where we did not need a crystal ball to predict how we would perform the next morning at Faithlegg Golf Club. 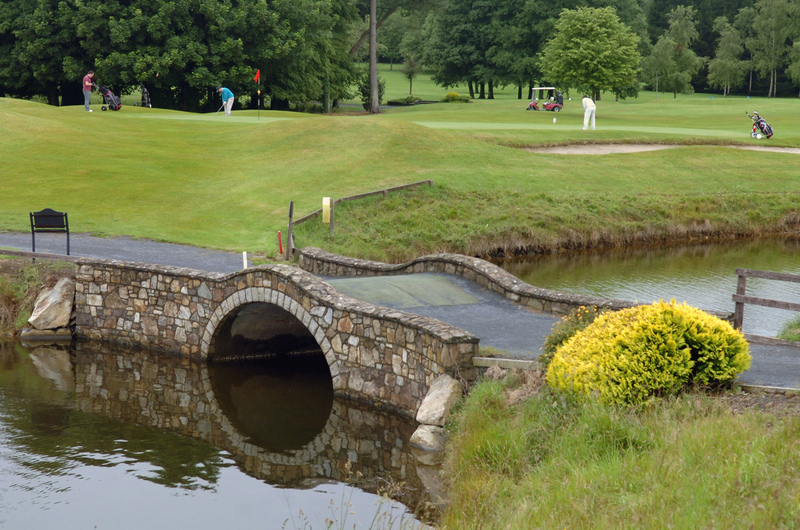 Several of us had played there before, as indeed we’d also experienced the two other courses on our itinerary which included Waterford Castle and Mount Juliet. We’d been invited back because they make up the 3 Club Golf Pass which, at a bargain price of 123euros you can play a round at each of them. Memories fade quickly for aging golf writers, so much so there were huge chunks of all three courses I did not recognise. You don’t hit the ball as far, either, so that tests the old grey matter too! The 200-acre estate can be found just four miles from Waterford City and on the banks of the Suir, and has been perfectly designed into a lush landscape. So, too, has Waterford Castle which has been converted into hotel and country club since I was last there, an unforgettable experience because we played all 18 holes in torrential rain. 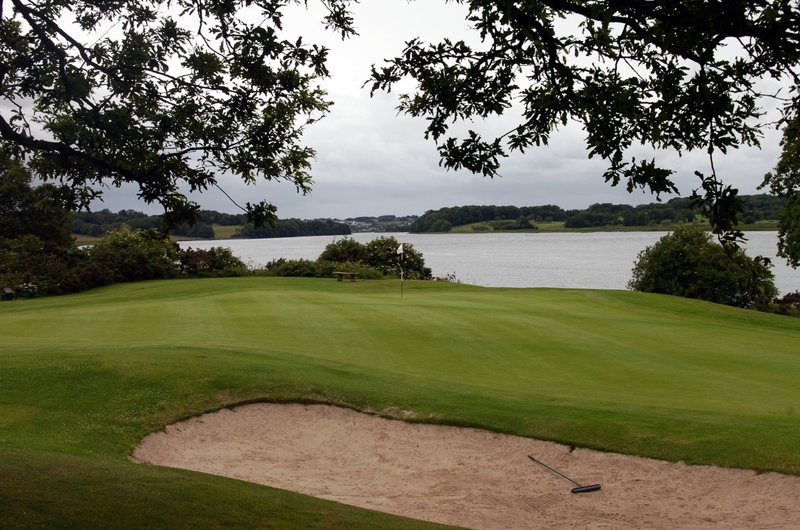 The elements were much kinder on this occasion and we found the island course, reached only by ferry and designed by former Ryder Cup player Des Smyth, had matured well in the 20 years since it opened and from the championship tees was a true test. 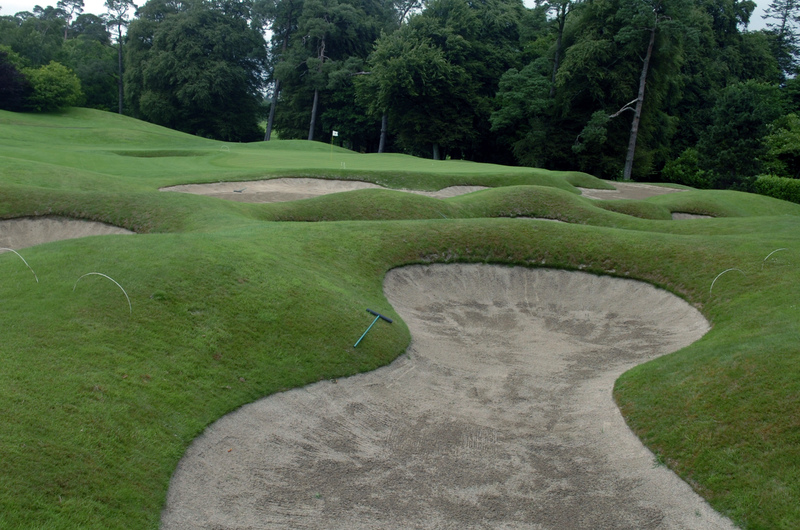 Mount Juliet, 20 miles north east of Waterford and an hour and a half down the M9 to Dublin, has all the hallmarks of the great Jack Nicklaus and despite being relatively young it has already hosted two World Golf Championships. The Golden Bear’s signature is instantly recognisable in the form of water hazards, huge bunkers and undulating fairways super fast greens which even Tiger Woods admired. At 7,264 yards and carved out of the hillside, it’s advisable to hire a buggy, or caddie. David Birtill travelled with Irish Ferries (08705 171717, irishferries.com).